Brakes are an essential part of your vehicle. Good maintenance is key to making sure that your brakes do what they were designed to do - keep you safe by stopping your vehicle. We use only reliable replacement parts that meet or exceed your vehicle manufacturer's specification. To ensure your brake rotors or drums have a clean, even surface -- necessary for proper braking, we will resurface or "turn" them, keeping the rotor/drum within your vehicle manufacturer's recommended specifications for minimum thickness. If they need to be replaced, then we will tell you up front and provide a written estimate too. Sometimes braking can become unsteady due to air bubbles in your vehicle's hydraulic brake line. By 'bleeding' your brakes, we will remove troublesome air bubbles and refill your hydraulic brake fluid to the manufacturer's recommended level with hydraulic fluid that meets or exceeds your vehicle manufacturer's specifications. Our ASE-Certified technicians are able to perform all the work necessary to ensure your brakes perform at their best. This includes installing master cylinders, all brake hoses, brake cables, wheel cylinders and re-packing wheel bearings. All of these services will only be performed if necessary. You will be given a complete description of what needs to be done and a comprehensive cost estimate before any work begins. 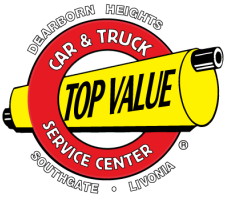 Visit our main locations in Livonia, Dearborn Heights and Southgate or any one of our other convenient auto repair shops.